Piano in Paradise - Tourism Town - The Tourism Marketplace - Find and book authentic experiences. 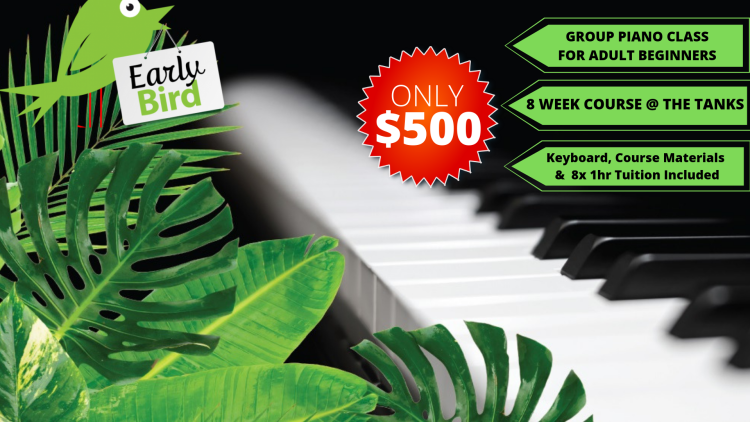 Piano in Paradise is kicking off Adult beginner piano short courses in 2019 here in Cairns. These 8 week short courses are designed to get anyone who has ever thought about trying out piano lessons to have a go, here in Cairns. The advantage of this program is that all instruments, equipment and music are included in the course price! You do not have to go out and buy a keyboard or invest months of your time to be able to learn to play music. Piano in Paradise has been designed to introduce people who have been curious about learning the piano by creating a cost and time effective solution, with the ultimate outcome being that you will be able to play songs by the end of 8 weeks. If you have ever wanted to learn the piano, our fun, informal, group short course is for you. Term 2 Enrollments are now open! For a limited time only, our beginner short course will have a huge $150 reduction! Spaces are limited so secure your spot today!